For a beach resort at Aruba we have a new opening for an Operations Manager (ico Rooms) who will mainly be focussing on Housekeeping, Maintenance, Front of House and Quality control. So if you prefer Aruba in stead of Jamaica or Bermuda….”come on pretty mama!!”. Please note: for Visa and Work permits a Dutch passport is a must. You will be joining a team of 4 star beach resort on Aruba with Dutch Management . The resort is located at one of the most beautiful beaches of the world. 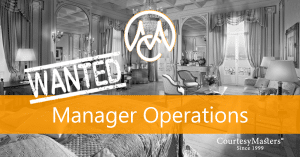 To apply for this job vacancy Operations Manager (ico Rooms) please send your personal elevator pitch, motivation letter and detailed Curriculum Vitae to Mrs. Larissa Zwart larissa.zwart@courtesymasters.com or click the Apply button here below. Should you have any questions regarding to this position or would you like to personally announce and motivate your application, please don’t hesitate and call Mrs. Larissa Zwart at +31-70-3227630 or +31-6-20106473.